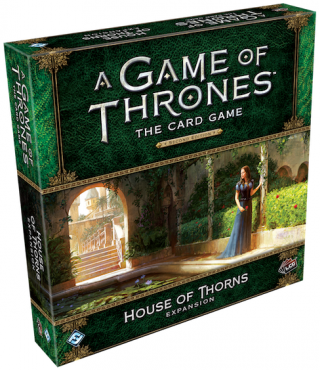 Fantasy Flight Games is proud to announce House of Thorns, the fourth deluxe expansion for A Game of Thrones: The Card Game! House Tyrell surges into the light with their deluxe expansion, House of Thorns! Within this box, you’ll find a wealth of new cards, bringing powerful new options to support and diversify House Tyrell’s most important themes, such as increasing the STR of their characters, removing characters from challenges, and winning challenges with the Knights and Ladies of Westeros. You’ll also find plenty of iconic characters sworn to House Tyrell entering the game, including Mace Tyrell, Brienne of Tarth, the Queen of Thorns, Margaery Tyrell, and the Knight of Flowers. Though House Tyrell receives the bulk of the cards in this expansion, you’ll also find new non-loyal cards for each of the seven other factions, many featuring ways to counter the primary strategies of House Tyrell. And since Oldtown falls within the domain of House Tyrell, it’s fitting that this deluxe expansion includes a new agenda focused on the Maesters of Westeros, as voted on by players during the Battle of the Trident. With new Maester characters and a potent new agenda, the power of knowledge could soon become a force to be reckoned with. Completing the expansion, you’ll uncover new options for any deck with seven new plots (one loyal to House Tyrell and six neutral).